A major scam of fake LPG connections has come to light in the district. A large number of genuine LPG consumers have been facing a lot of problems in getting their gas cylinders refilled because of the “shortage”. Consumers using cooking gas supplied by Hindustan Petroleum Corporation (HPC) in this region are facing severe shortage of the cooking fuel. Haryana Education and Transport Minister Mangeram Gupta has said the state government is making efforts to regularise the guest teachers who had rendered more than one year of service with a good record. The Executive Council of the Guru Jambheshwar University of Science and Technology today authorised the Vice-Chancellor to implement the Sixth Pay Commission recommendations in the university as notified by the state government. Students of diploma in education (DEd) studying in various institutes of the state held a demonstration and gave a memorandum to Deputy Commissioner JS Ahlawat here today. In the memorandum addressed to the Chief Minister, students alleged that institutions had been charging fees ranging between Rs 70,000 and Rs 80,000, disregarding the government’s directions to the contrary. The Haryana government has revised the rates of the house rent allowance (HRA) admissible to its eligible employees with effect from January 1. An official spokesman said here today that as per the revised criteria for classification of cities and towns based on the population, employees residing in towns having a population of 50 lakh and above would get the HRA at the rate of 30 per cent of the pay in the pay band plus grade pay (plus MSP plus non-practising allowance, wherever applicable). After getting positive response from the anti-polythene drive, the district administration has launched the second phase of the campaign against plastic bags. Not satisfactory - that’s the verdict of the Congress top brass on the report cards submitted by the ministers of the Haryana government. 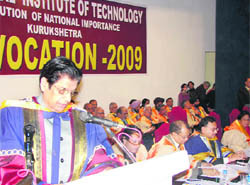 The National Institute of Technology organised the sixth annual convocation in its Jubilee Hall here today. Minister of State for External Affairs E Ahamed was the chief guest on the occasion. Dismissing the bail pleas of at least three accused in the Gurgaon kidney scam, Justice Ranjit Singh has laid down a law for all times to come. The CBI court dismissed the bail application of Seelak Ram, one of the accused in the Sarita suicide case, here yesterday. The court had earlier also dismissed his bail application. While dismissing the bail application, Special Judge of the CBI court AK Verma observed in the order, “It was a case of gangrape committed by police officials who were supposed to be protectors of law”. Justice Tej Pratap Singh Mann yesterday issued notice for May 13 to Haryana panchayats and Rural Development Department Secretary Urvashi Gulati and Hisar Deputy Commissioner OP Sheoran. On a call given by the joint action committee of roadways’ unions, workers of the Haryana Roadways today held a demonstration and raised anti-government slogans at the local roadways’ depot in support of their demands. Chief Minister Bhupinder Singh Hooda has approved an amendment to the Haryana State Agricultural Marketing Board (sale of immovable property) Rules, 2000, to allow basement and upper storey in shops and booths of mandis. After an initial warning by the district authorities to the LPG dealers to shed off fake connections or face action, the dealers voluntarily declared that 20,000 out of 1,20, 265 connections in the district were fake. The authorities are in the process of cancelling these connections after giving a hearing to the “consumers” and will begin a door-to-door survey of the rest of the consumers to find out whether there were more fake connections. Locals have been facing an acute shortage of LPG in the district for the past some time. While long queues of consumers can be witnessed outside gas agencies in the district, the commodity is freely available on the black market. Even hotel and restaurant owners and vehicles owners have been using domestic LPG cylinders for their establishments and vehicles with impunity. District Magistrate JS Ahlawat has entrusted the job of finding fake LPG connections to Additional Deputy Commissioner CG Rajnikanthan. At a meeting with gas dealers and officials of the Food and Supplies Department a month ago, Rajnikanthan told them to voluntarily find out fake LPG connections and submit the list within a month. As per the lists submitted by the dealers to the authorities concerned recently, only 1,01,044 out of 1,20,265 connections in the district were valid. Balaji Gas Agency, the oldest agency of Fatehabad town, had 26,675 connections. However, now it has claimed that only 21,043 connections are in order. Among other LPG dealers of the town, the number of genuine consumers has fallen from 10,220 to 8,916 with Sukhmani Gas Agency, from 7,368 to 5,911 for Krishan Gas Agency and from 6,257 to 5,507 for Manohar Gas Agency. Similarly, the total number of connections has fallen from 27,251 to 21,281 for Mukul Gas Agencies, Tohana, and from 13,003 to 10,857 for Rasoi Gas Agencies. Ratia Gas Agency, Ratia, Indian Gas Agency, Jakhal, Narender Gas Agencies, Bhattu, and Bhuna Gas Agencies, Bhuna, too are left with 6,635, 6,658, 7,816 and 6,820 out of 6,827, 7,679, 8,070 and 6,915 LPG connections, respectively. “Now, we will conduct a door-to-door survey of the district to find out if there are some other fake connections or more than one connection with a one family,” said Rajnikanthan. He said the authorities would cancel all fake connections after affording an opportunity of being heard to the persons against whose name these connections exist. According to the All-India LPG Distributors Federation (north-western region), all those LPG dealers who are getting their supplies from the Jind plant of the HPC have piled up a huge demand for refills, resulting in public complaints. There is a reported backlog of more than 14,000 refills in Chandigarh, 5,000 refills in Ambala, 5,000 refills in Panchkula, 3,500 refills in Patiala and 2,500 refills in Solan; all from the HPC consumers. A consumer has to wait for the refill for 10 days to 20 days. Sources said the supply position of Indane and Bharat Gas was relatively easy and the pendency of the refills of these companies was not very long. Capt Reet MP Singh, general secretary of the federation, said here today that the federation’s worst fears had come true. A core group of the federation had met in Karnal on November 7 last and had expressed its apprehensions that with the advent of winter, the demand for LPG would rise considerably, resulting in considerable backlog in the region. It is alleged by the federation that the HPC supply position is precarious because the company has decreased the filling of domestic cylinders. It has not only maintained the filling of commercial cylinders, rather in certain areas the supply of commercial cylinders has gone up by 25 per cent. In certain cases, consumers have been forced to buy expensive commercial LPG for domestic use. However, area manager of the HPC Rajiv Bhargav denied the allegation. He said the company was facing shortage of bulk LPG. He said the situation would improve after about 10 days. Capt Singh said the HPC should first normalise the supply of domestic cylinders before insisting on the dealers to buy commercial cylinders. He urged the HPC consumers to bear with their distributors as he said the current situation was not of their making. Haryana Education and Transport Minister Mangeram Gupta has said the state government is making efforts to regularise the guest teachers who had rendered more than one year of service with a good record. Talking to newsmen after inaugurating a three-day state-level science exhibition on the premises of the Government College for Women here today, Gupta said the state government was seeking legal opinion regarding the matter. “The services of guest teachers, who have completed one year in service and have a good record, will not be terminated...If a regular teacher is appointed in place of a guest teacher, the guest teacher will be shifted to some other nearby school,” he maintained. On being asked about the sharp increase in students’ fees at certain privately managed schools, the minister said he had not received any complaint in this regard till date. Addressing the gathering at the function, Gupta asserted that health and education were the topmost priorities of the state government. Referring to the demand of constructing a stadium in the college raised by Gurgaon MLA Dharamvir Gauba, the minister said this would be done after getting the land transferred from the Town and Country Planning Department. Gauba had pointed out that two acres were required for constructing the stadium as per government norms and the college had five acres available with it. He also urged the minister to expedite the work on setting up of Rajiv Gandhi Education city at Kundli as it would benefit the students of the state. The principal of the host college, Dr Ranjana Lal, proposed a vote of thanks. 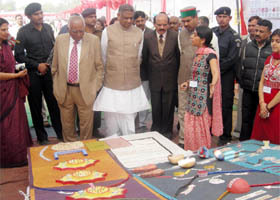 She said 166 exhibits of 111 colleges from all over the state had been displayed at the exhibition. An official spokesperson said here that the new pay scales would be implemented soon. The EC also approved the introduction of a two-year MSc (Development Communication) course by the Department of Communication Management and Technology from the next academic session. He said Prakash Arora had been promoted as Deputy Registrar while SL Saini and SC Aggarwal had been promoted as Assistant Registrars. The spokesperson said the kit allowance for sportspersons had been raised to Rs 1,000 from Rs 500 and the daily allowance to Rs 150. Students of diploma in education (DEd) studying in various institutes of the state held a demonstration and gave a memorandum to Deputy Commissioner JS Ahlawat here today. In the memorandum addressed to the Chief Minister, students alleged that institutions had been charging fees ranging between Rs 70,000 and Rs 80,000, disregarding the government’s directions to the contrary. Dalip Singh, state president of the Haryana JBT Students Association, alleged that when they had demanded information under the RTI Act, the institutes revealed that they were charging Rs 9,600 for a two-year course. He maintained that the same fact had come in reply to a case of Amardeep and others Vs state of Haryana and Sunita Vs the state of Haryana in the Punjab and Haryana High Court, where the respondent, Bhagwan Mahavir Jain College of Education, admitted that the total fees for a two-year diploma course was Rs 9,600 inclusive of all funds. He alleged that private institutions had been intimidating students for protesting against the “scam”. Meanwhile, the Students Federation of India (SFI) also staged a demonstration here today in support of their demands. In a memorandum addressed to the Chief Minister, the SFI demanded revival of student body elections, revocation of semester system from schools and roll back of hiked fees in polytechnics. The Haryana government has revised the rates of the house rent allowance (HRA) admissible to its eligible employees with effect from January 1. An official spokesman said here today that as per the revised criteria for classification of cities and towns based on the population, employees residing in towns having a population of 50 lakh and above would get the HRA at the rate of 30 per cent of the pay in the pay band plus grade pay (plus MSP plus non-practising allowance, wherever applicable). Earlier, these towns were classified as A-I. He said in case of population of a town being between 50 lakh and five lakh, the rate of the HRA would be 20 per cent. Earlier, these towns were classified as A, B-I and B-2. Similarly, for towns below a population of five lakh, which were earlier classified as C and unclassified, the rate of the HRA would be 10 per cent. He said these orders would not apply to part-time workers, casual labour, staff employed on daily wages and those working on the piece rate system and contract basis. The second phase aims at countering use of plastic bags in rural areas of the district. Launching the drive from Jatal village, Deputy Commissioner Vijay Singh Dahiya said in order to completely eradicate polythene bags, it was important to reach out to the rural population also. The second phase was started with the distribution of cloth bags amongst villagers, who pledged not to use polythene carry bags. Later, the administration went door-to-door to provide one cloth bag to each household in the village. The DC said in the first phase of the campaign, all 31 wards of the city were covered. A number of social and voluntary organisations held meetings and seminars in the wards to generate a public opinion against polythene bags. As many as 1.5 lakh cloth bags were distributed amongst the locals to overcome the dominance of polythene carry bags. There is already a complete ban on the use of plastic bags in the district and the shopkeepers have been doing their bit in encouraging the customers to give up the use of plastic bags. The DC said for the complete success of the campaign, it was important that the general public came forward and endorsed the drive. He said the campaign would be taken to all blocks of the district. In the third phase, all important villages would be covered while in the fourth phase, the remaining villages would also be brought under the campaign. Dissatisfied with the performance charts submitted by the ministers about their respective departments, the party has now sought clarifications from them and sought replies till February 3. As a run-up to the election exercise and for first-hand information on the ground reality, the AICC treasurer and party in charge for Haryana affairs, Moti Lal Vora, immediately after taking over had asked the ministers to prepare a self-appraisal report, complete with achievements and shortfalls both, and submit it to him. These reports, asked for in mid-December, were readied by the ministers and sent to Vora in the first week of January. Having gone through the reports, he has now asked them to clarify certain issues as a part of the reality-check mission and to see the groundwork achieved. Speaking to The Tribune, Vora confirmed that he had got the reports but had sought clarifications from the ministers concerned with regard to targets met and their personal involvement in the projects listed out. “The government is doing fine but I have written to the ministers, asking them for further clarification to supplement whatever they have sent to me,” he stated. Sources in the Congress said while some party workers had already apprised the party in charge of “chronically absent and non-functional” ministers, the party top brass was not particularly happy with the way the report cards assignment had been handled. Other ministers had only listed out every scheme initiated by the departments under them without giving any targets or specifying whether anything had been rolled out or not. “In the absence of any indication of personal involvement in evaluation of projects rolled out from time to time, the party seniors are taking the scheme-listings with a pinch of salt,” a senior leader said. The in charge has asked for replies from ministers on all his queries by February 3 when the Haryana Pradesh Congress Committee (HPCC) will meet under the chairmanship of Vora at Haryana Niwas. Also, recently constituted campaign committee for Haryana under former minister Venod Sharma will have its first meeting where Vora will likely lay down the course campaigning for the Lok Sabha elections. Highlighting the need for effective synergies among industry, government, educational system, research and development, environment and consumer, Ahamed said to attain these there should be a vibrant mechanism of regular interaction and feedback between the institutes of higher studies and engineering education and industry so as to ensure progressive adjustments in the curriculum. He urged the graduating students to engage themselves in those economic and social developments that reduce disparities and assist the society in raising its standards of living, behaviour and morality. Director of NIT MN Bandyopadhyay emphasised the institute’s role in imparting value-based and career-oriented education of high quality. During convocation, 292 BTech (civil - 44, computer - 33, electrical - 65, electronics and communication - 80 and mechanical - 70), 81 MTech, 59 MBA and 11 PhD degrees were conferred upon students. As many as 36 meritorious undergraduate students were awarded academic prizes. Gold medals were awarded to five branch toppers. Jyoti Narang was adjudged the best all-rounder for 2007-08. Shri Shyam Sunder Dhingra Medal went to Anshul Bansal of Civil Engineering, OP Jindal Engineering and Management Scholarships were won by Somavedam Pramod, Mohit Gupta, Neha Chaudhary and Shubhani Gupta. Justice Ranjit Singh has made it clear that once the complaint is filed within the statutory period in cases where its filing is mandatory under the law, the accused will not be entitled to bail if the challan is not presented before the court in 90 days. The judgment fully covers not only the cases under the Transplantation of the Human Organs Act (TOHO), but also under The Prevention of Food Adulteration Act and other cases where the filing of complaint is mandatory. Disposing of two petitions by nurse Linda, Manoj Kumar and other accused, Justice Ranjit Singh ruled: The grievance of petitioner is that the CBI has not filed the chargesheet within 90 days of the date of arrest… “The cognizance of an offence under the TOHO Act, 1994, in terms of Section 22, is to be taken on the basis of a complaint filed by an appropriate authority. “The conceded position is that the complaint against the petitioners under the Act was filed within a period of 90 days…. Once the complaint was filed within the statutory period for a cognisable offence, which is non-bailable, of which the cognisance was taken by the Magistrate, the petitioner would not be entitled to seek the protection of Section 167 (2), CrPC, even if it is construed for the sake of argument that a complaint is not a police report or cannot be treated as such.” Justice Ranjit Singh asserted: “I am not inclined to go further into the aspect whether this complaint can be treated as a police report for the purposes of offences under the IPC. Justice Ranjit Singh concluded no case was made out for interference in the order of Ambala-based CBI special judicial magistrate declining the petitioners’ prayer for release on bail. Sarita, a resident of Rohtak, had committed suicide in front of the Haryana police headquarters in June last year. 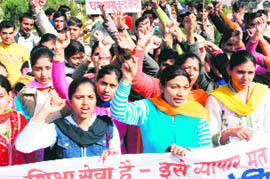 Later, her husband had alleged that two of the police officials of the Rohtak CIA staff had raped his wife. The CBI had arrested the duo. Justice Tej Pratap Singh Mann yesterday issued notice for May 13 to Haryana panchayats and Rural Development Department Secretary Urvashi Gulati and Hisar Deputy Commissioner OP Sheoran. They have been asked to show cause why proceedings under the contempt of court be not initiated against them for violating the directions on taking required action against a sarpanch and others. Chief Justice Tirath Singh Thakur and Justice Hemant Gupta directed petitioner-advocate Jagbir Malik to place on record a copy of the order vide which nine members, including Chairman of the Haryana Public Service Commission (HPSC), had been placed under suspension by the state. The directions were issued during the resumed hearing on Malik’s plea for restraining the HPSC from going ahead with the selection of 54 assistant district attorneys (ADAs). The irate workers took rounds of the local depot with black flags in their hands. Addressing the agitating workers, Ramesh Majekan, a senior leader of the joint action committee, alleged that the roadways’ workers had been discriminated against in the matter of pay scales. He said the government had recently announced to grant 4,000 new permits to private buses, which, he alleged, was highly detrimental to the interests of the roadways’ workers. Mahabir Singh, another senior leader of the roadways’ workers, alleged that the contractual system of appointments still persisted in the roadways and vacant posts of drivers and conductors were not being filled by the government. An official spokesman said here today that a decision to this effect had been taken to facilitate the allottees of plots of booths and shops in mandis. He said as per the amendment, the allottees of plots of shops and booths, who intended to construct basement, would have to pay an additional amount equal to 10 per cent of the allotment price of the plot. Similarly, if an allottee of a booth plot intended to construct an upper storey, he would have to pay an additional amount equal to 10 per cent of the allotment price of the plot. However, second storey would not be allowed in these booths. He said where basement in shops or booths and upper storey of booths had already been constructed by the allottees without taking approval, the same would be regularised after composition of such violation by charging an amount equal to 15 per cent of the allotment price of their plots with the prior approval of the chief administrator. Thereafter, the completion certificate in respect of such shops or booths would be issued by the authority concerned.